Registration for the 2019 Spring Conference and Expo is open! As a mission-dedicated, excellence-fixated aging services provider, you and your team must plan and execute for the future, even while you take care of today’s needs. Conventional models of service delivery are being overtaken by the future… at an ever more rapid and unpredictable pace. Plan to join your colleagues at the 2019 LeadingAge Kansas Spring Conference and Expo for cutting-edge education, a great trade show, special events and countless networking opportunities. This year’s event is packed with sessions about future (and current) trends and disruptors in aging services, clinical care and behavioral health, reimbursement and regulatory compliance and more. 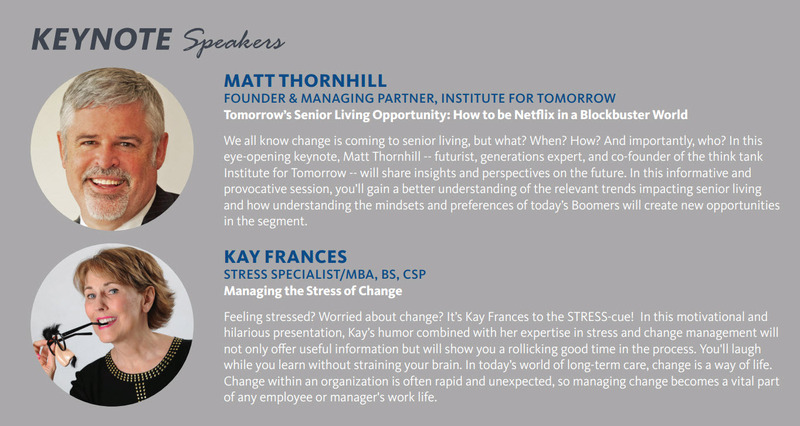 And be prepared to be inspired and have your funny bone tickled with our conference closer. We look forward to a great time together in May!